Hidden in last month’s update to Logic and MainStage is a feature a lot of sampler lovers have been missing. You need the latest MainStage to access it, but it allows you to easily create sampled software versions of external instruments. Italian developer Redmatica had a host of technologies for transforming hardware instruments into software samples, all built around Apple’s EXS24 sampler. Anyone who’s ever built samples of hardware knows the process can be fairly time-consuming: you trigger notes one at a time, record audio from them, and map that audio to the keyboard. Redmatica’s tools made all of that happen more or less automatically. In the form of the products Keymap Pro, AutoSample, ProManager, and GBSammpleManager, they sucked in sounds of outboard gear directly to sample instruments you can use. All that ended when Apple bought the developer in 2012 and it immediately closed shop, leaving users in the cold. (See reporting from the time.) You could continue to use existing versions, of course, but without further support. It was unclear just what Apple intended to do with the tech. Now, with Logic Pro X 10.1, that changes. The accompanying MainStage 3.1 adds Redmatica’s tech for automatically making sample instruments. Apple didn’t focus on that new feature – you would have missed it apart from the release notes – but it has quickly become buzzed about in forums among enthusiasts, so it obviously matters to someone. MainStage itself is a nice tool, one that I think doesn’t get enough attention from the music tech world. It has some really powerful features for setting up set lists with software instruments and effects, and allowing users to focus on playing rather than squint at a computer. And it has accordingly earned a loyal following from a lot of gigging artists. But whether you want MainStage or not, you might consider paying for it just to get this single feature. Not that Apple has exactly advertised it – too bad, given a feature that magically transforms hardware into software is kind of cool. You might have trouble even finding Auto Sampler. It’s a MainStage plug-in, meaning it acts as an effect device that appears only inside the MainStage Channel Strip. Inside the Audio FX section of that Channel Strip, you instantiate it just as you would another effect; it’s under the MainStage submenu > Utility > Auto Sampler. Then, you get the lovely interface at top. 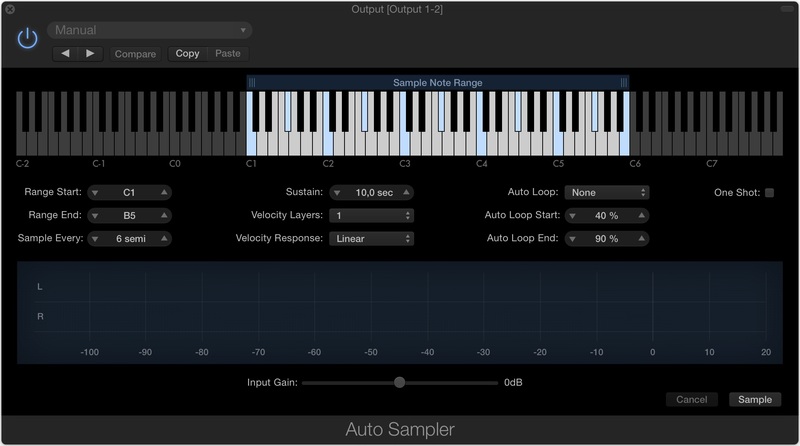 Set a range, choose how you want samples to be triggered and looped, or set one-shots. You can even set velocity layers. I don’t think you have quite the range of functionality originally available from Redmatica, but MainStage is fairly cheap, and this is almost reason enough to use Logic, let alone pony up a little more cash for the feature. This basic interface still seems to satisfy what most people would do with Auto Sampler, though if there are tools you miss from other Redmatica offerings, I’d love to hear about it. Anyway, Logic is already one of the more inexpensive DAWs on the market, and App Store upgrades are free, so paying a little extra for Auto Sampler is hardly a huge burden. For now, if you want Auto Sampler and don’t care about MainStage, you can create those EXS24 instruments in MainStage and then they’re made available to Logic. In fact, you can even use them in GarageBand, for a very affordable solution, indeed. Let us know if you’re making use of this feature and how – and if you’re a veteran Redmatica user. For a more agnostic solution, check out SampleRobot. It has a broader feature set overall, and works with more sample formats – not just EXS. In fact, it’s useful for sampling tasks in general.